New super blends, funky new stores, last minute festive buying – it’s been a busy couple of weeks on the cigar front. 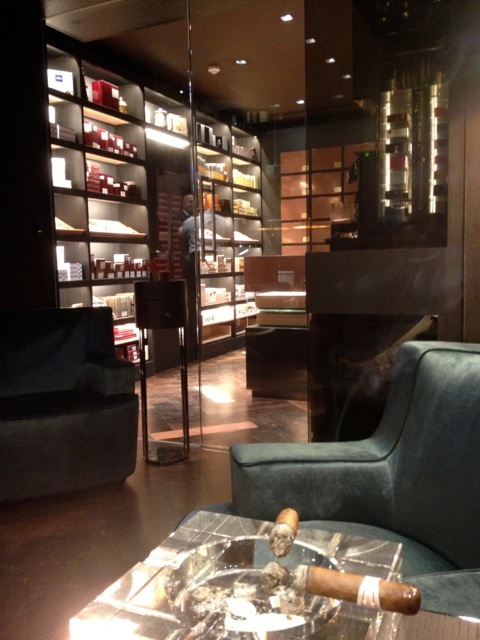 Last week I paid a clandestine visit to Mayfair to catch up over a Hoyo de Monterrey with Robert Emery, industry stalwart and now manager of a beautiful new store at 1 St James’s Street. Well, it’s not exactly new, but a wonderful refurbishment of the old Dunhill store that had become rather forlorn in recent years. 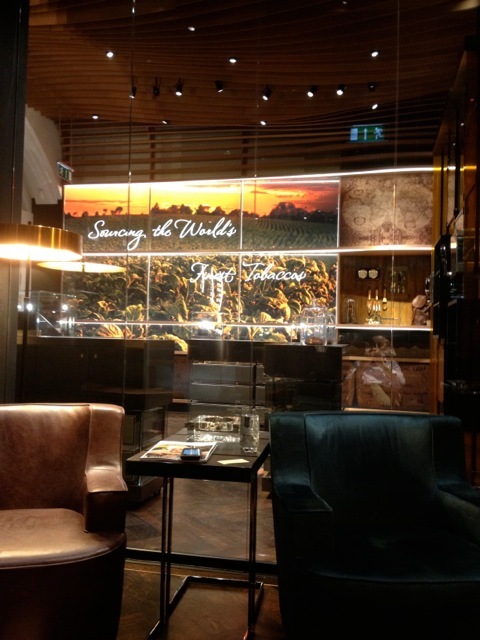 Now designated as Dunhill’s flagship European store, it has to be seen to be believed. Modern, cool, clubby but with a nod to tobacco’s ancient history, no expense has been spared in its refurbishment. The overall feel is a little ‘laboratory’ – glass jars, display cases with directional LED lights and apothecary drawers abound in the shop. Then there’s the very cool all glass sampling room – a delightful place to while away an hour with a good coffee, comfortable armchair and a copy of the day’s papers. Beyond this is a stunning walk-in humidor, complete with brass-fronted member’s lockers and beyond still further is the inner sanctum – a tiny but delightful demonstration room, complete with a tobacco tasting wheel with samples, maps to show the distribution of the world’s tobacco stocks and leather-bound samples of a myriad of tobacco types to feel, smell and discuss. Bravo to British American Tobacco, who own Dunhill and who have put their not inconsiderable shoulder behind this project. Everything from the marble worktops to the ‘stressed adventurer’ souvenirs lying around echoes the thought and time that’s gone into the whole project. There’ll be plenty to come from this great new cigar heaven and you’ll read it here first. Stepping away from St James’ and into Shepherd Market for my usual snuffle around the humidor at Alfie Turmeau’s, my eyes settled on a distinguished robusto, made especially for owner Mitchell Orchant by Regius Cigars (see my story on Regius and their £40,000 cigar here). Not wanting to waste the opportunity to try the stick, I descended into the den – or sampling room, if we must be precise – and fired it up immediately accompanied by an espresso. I was floored. This is Nicaraguan, blended at Nestor Plasencia’s factory, but I can vouch it will hold its own against a Havana any day of the week. Smooth, medium bodied and flavourful throughout, it was a delightful morning smoke – and I haven’t even told you the best bit yet. 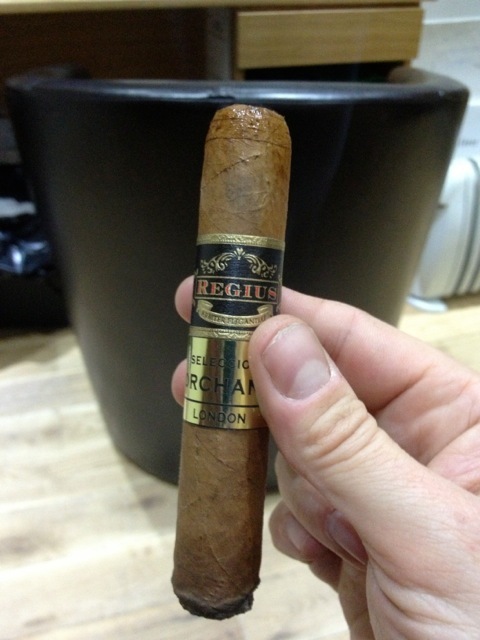 Almost incredibly in our uber-expensive, tax burdened cigar market, Mitchell Orchant and Akhil Kapacee at Regius have created a truly delicious, long-filler, hand-rolled cigar – for less than £8. I maintain you would have to spend at least another fiver to find anything this good. If you can find ‘em, buy ‘em because they’re disappearing off the shelves fast. The good news is Kapacee tells me the tobacco for the next year’s blend is already aging at the factory. The collaboration goes further, with a little Culebra (three cigars intertwined in traditional style) made for Orchant by Regius. I am hoping to give these a go in 2014 and will report back. So, we finally arrive at the festive frolics. I have re-stocked the Liebherr humidor I currently have on test, have replenished the whisky bar and am typing my final article of 2013. 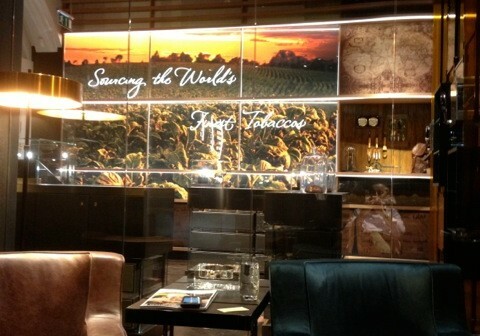 It’s been a great 12 months, with the London cigar scene in particular going from strength to strength. Enjoy your smokes and I’ll see you ready for a fresh one in the New Year.